My beloved blue point, Cairo, died in October at age 19 (and a half). I have so many wonderful memories of him - snuggling under the covers, sitting out on the green floral-smelling screened porch in the summer, racing around the house, calling out to each other - but it was, of course, gut-wrenching to have him go. "Some people take coffee breaks; I take cat breaks. 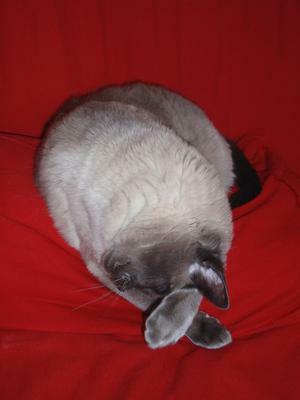 When I’ve finished part of a task or have hit some minor wall, I search out my cat - usually asleep on the couch - and rub his neck until he stretches his sleek muscles, purrs, and (honest, this is true) smiles happily with his eyes still closed. After a couple of minutes of gentle, sunny fellowship, of such perfectly peaceful domesticity, I feel recharged and go on to the next thing I have to do. If you’re a pet lover you understand full well that your particular dog or cat or horse or duck isn’t just an example of a species; he or she is a unique individual with a very distinctive personality. My cat is the same way. 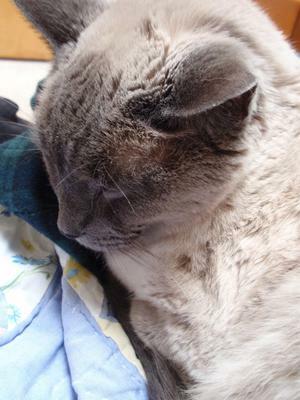 He’s a round-faced blue point Siamese and I got him fourteen years ago. In a way, he chose me; he was ten weeks old when he stumbled over my feet while chasing a sibling. He looked up, shaking his head to clear it, and practically said "sorry" out loud. I had to have him. I named him Cairo in part because I was studying ancient Near Eastern archaeology and World War I diplomacy in the Near East, and in part because of the way Humphrey Bogart says "Joel Cairo" in The Maltese Falcon - that Bogart voice, deep and unhurried and monochromatic, like fog under a street lamp at night. 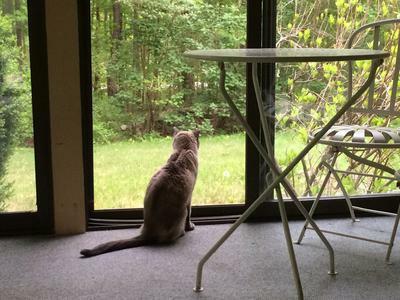 Somehow, a gray Siamese kitten seemed to fit the word, fluid and exotic. When Cairo was brand new I was waitressing the night shift at an all-night diner. I’d come home at seven in the morning, have cereal and go to bed, and this little kitten would sit like a sentry next to me, keeping watch but never disturbing my rest. Leave it to a cat to understand the concept of sleep. On days off we’d have fun. He’d help me sort my tips by pouncing on the coins with intellectual intensity and great wit. A good companion from the first, he’d shadow me around the house and whenever I’d bound upstairs he’d try his best to follow, tiny kitten feet padding along. Once I couldn’t help but take cruel advantage of my few seconds' lead. Cairo knew I’d head left at the top of the stairs toward my room so this once I turned right, and hid behind the solid bannister. Up he came, a 3-month-old fuzzball, cheerfully trotting to the left without seeing me. "Hey!" I called out and he wheeled around, fur all puffed up. "HISS! HISS! HISS!" Oh, I laughed so hard. When he saw that it was me, he started purring in apology for his language. Cairo is faster than I am now, and likes to play 'chase'. Once while I was making lunch he attacked my feet viciously, out of the blue, and I got truly angry. "Why, you little rodent! Boy are you going to pay!" "Oh, whoops" Cairo’s expression read, frozen suddenly in horror. "I should not have done that." "Darn straight you shouldn’t have done that!" I lunged, but he was off and up the stairs, me hot after him. "Come back here, you little fur basket!" I couldn’t even see him as he ran through the double-entried upstairs bathroom and - this is a small house, but since it used to be a miniature duplex, it happens to have two sets of stairs - back down via the north stairwell. "You can’t hide from ME, Cat!" He raced past the living room, and, yes, up the south stairs again. This time when I followed him up through the bath I closed its far door. We made the furious loop one more time, and when I got back upstairs I found Cairo, in full fear of the wrath of God, tucked into the bathroom sink. He’d tried to go through the door at high velocity and, finding the way blocked, had been carried by sheer force of motion into the basin. The sight was so funny that I figured that’d been enough punishment. We hardly ever argue, Cairo and I. He’s a very good cat, delightedly greeting me when I come home, curious about guests while being proper and polite, and never getting up on counters or tables. At 14 he’s full of energy, likes to play, look out the windows, and go gracefully galumphing like a herd of wildebeest across the upstairs in the morning. He also likes to talk, "prrt"ing what sound like questions, meowing back and forth with me. There’s a little bit of a language barrier, but after so long we pretty much get the gist of what the other is saying. And he likes to sleep. He’s a cat - he’s a connoisseur of rest. Sometimes his attitude about it makes me think of him as an old man who sits around my house reading the newspaper all day. He does chew on vased flowers if able to get near them, but they’re not poisonous and the worst that usually happens is that my roses look like their petals have been trimmed with pinking shears. He’s certainly the cleanest animal I’ve ever known, his rabbit-soft fur immaculate and beautifully groomed, mainly through his own efforts. He smells wonderful - sometimes like baby powder, sometimes like nutmeg or light cinnamon. "Mmm ... you smell nice", I’ll say, as, eyes closed, he touches his nose to my cheek and starts to purr. "You smell nice too", he’ll answer. What a lovely tribute and memorial to Cairo and what a lovely name, too; thanks so much, Aurelia. Cairo looked like a gorgeous boy and it's so terribly hard when they leave us, at whatever age they reach. He had a good long life with you though and I'm sure it was a very happy one; I love stories like this! One-year old "Coco" was adopted about six weeks ago from the SPCA after the death of my 14-year-old Pomeranian dog who died in my arms but never in my heart. 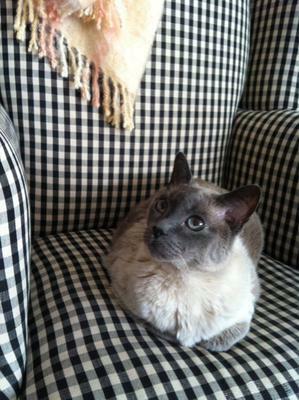 My decision to adopt a Siamese cat came from no where yet he was a street rescued and had no history except that he was extremely mistrustful of everyone and myself. After a couple weeks without success, I tried to find Coco another suitable furever home with a Vet friend who was truly grateful to adopt Coco. Yet his making guttural sounds, hissing, and growling scared him away. Another friend suggested to ignore him completely. Eventually, Coco has turned around after one month. A pet is an angel fur in disguise. Thank you, Caroline and Gwyn! Thank you both very much for your lovely comments on Cairo's story! He will indeed live in my heart forever, and I can't tell you how much your thoughtfulness means to me. With all best wishes for a wonderful Spring! A beautiful story. I too had two Siamese, brother and sister, Tyler and Tiffany. I had to give the boy kitty back to his original owner because of spraying issues; the girl kitty passed away about a year and a half ago. We now have an Oriental Shorthair, much different than our Siamese, kind of a wild child. Love her, her name is Jade, but I do wonder sometimes if we should have stuck with the Siamese breed. This may be our last cat as my husband and I are in our 70s. I read your account of Cairo's life and I loved every minute. You are obviously a real cat person who deeply understands the cat psyche. I am sorry that he has left you but nevertheless he bestowed upon you a wealth of memories that will keep him safely in your heart for ever - like mine did with me. They are not just animals, they were irreplaceable friends and companions who are sorely missed but fondly remembered.